In the current climate, it is increasingly difficult to keep up with the intricacies and the “ins and outs” of health insurance plans. What does your insurance cover? How much will they pay your doctor? Will your doctor require you to pay more than your insurance company pays? Will your insurance company require YOU to contribute to this payment out of your own pocket—despite all you have paid in premiums? If you don’t have hours to spend on hold, it can be difficult to get quick answers to such questions and no one likes getting an unexpected bill for an unexpected copayment! One new bit of information not always mentioned, is that the size of your copayment might depend on where you have your “test” done—even between two places that both take your insurance! We have been shocked at the number of patients who have called us to ask if MRI’s done at our facilities still counted as “office visits.” When we asked why, we were told that if they had their MRI at a hospital, their insurance company would charge them a copay of several hundred dollars, but that if the test was done at a doctors office (or “Independent Testing Facility”), the copay would be $47. Quite a difference! Ask questions. It could save you hundreds of dollars. The quality of an MRI is based on the strength of the MRI scanner—NOT where that scanner is located. The quality of an MRI Report is based on the education and exerience of the Radiologist (whether a General Radiologist, Neuroradiologist, etc. )—NOT where that specialist is located. Paying more does not necessarily mean you are getting better quality. Having an MRI at a hospital does not necessarily mean you are getting a better study. 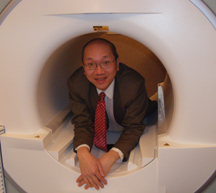 MRI Consultants has been providing the highest quality MRI studies since it opened its doors in 2007. As we have expanded, we have done our best to keep quality high and expenses to patients low. Our Out-of-Pocket Discount is the best in the State. $500 for a non-contrast MRI. 3T quality. Clearer images. High resolution. Faster and stronger. And the 32-channel, 3T MRI scanner that we have installed in our new office in Lewes, Delaware is second to none for brain imaging. You’ve heard of Traumatic Brain Injury? Our scanner in Lewes is able to track this using a process called Diffusion Tensor Imaging (“DTI”). It can actually show you microscoptic damage to the fibers of the brain! Another great advance in MRI technology is Diffusion Weighted Imaging (“DWI”). It is as much as 96% sensitive for finding cancer. We routinely use this special scan whenever a doctor orders an MRI of the abdomen—and we do these extra sequences for no additional charge! We also use a sequence called REVEAL, which can show cancers as “light bulb” lesions. Just this month it showed 3 lesions in the liver where the more expensive PET scan showed only a single large lesion—missing the two smaller left lobe lesions. Your doctor may not be aware of this revolutionary scanning technology. It finds pancreatic cancer as good as high resolution contrast enhanced CT but without any IV contrast! Most of the research on this excellent technique can be found by a simple web search—for diffusion weighted imaging of cancer. The two white dots inside the liver are metastases, which CT or PET scans failed to find. CONTRAST is an issue of growing concern. Adding contrast to the MRI can change the diagnosis as much as 25% of the time. Just this past week several abnormalities were ONLY seen after using contrast. BUT, there are several different kinds of contrast approved for use with MRI. Not all contrasts were created equal. Some have been linked to a rare, debilitating illness. (www.safecontrast.com). Sadly, the three contrasts (Multihance, Prohance and Eovist) that have never been linked to this disease (“NSF”) cost just a few dollars more per dose and there are some MRI Providers who do not stock it for this reason. Ask your MRI Provider which contrast they use! We only use safe contrast! We believe in using the safest drugs for our patients. It is simply good business. With the opening of our office in Lewes, we now have the finest MRI infrastructure in Delaware, making us uniquely positioned to offer the quality MRI imaging you need. And, as high quality has always been our goal, even our “open” MRI is an 18-channel 1.5T MRI scanner! (Ask your MRI provider how many channels their closed magnet has). Because of its extraordinary (100%) sensitivity to Breast Cancer, we generally prefer to do Breast MRI’s on our 3T MRI, but for someone who either will not fit, or who is extremely claustrophobic, our 18-channel 1.5T OPEN BORE MRI is a good alternative. Ask questions. Get the best. More information can be found at www.mriconsultants.net and www.bestopenmri.net, or www.safecontrast.com.